Zoo College is modeled after the Keeper Training offered at Big Cat Rescue. It is the only online, virtual training center, where you can test your skills against real life animal care challenges. The lessons you will learn have been tested and improved over more than 20 years in dealing with some of the most dangerous and majestic carnivores on the planet. 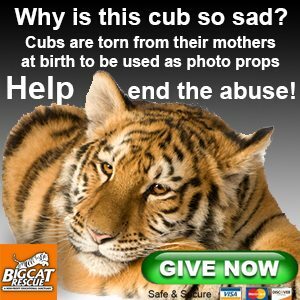 Before now, the only way to get this extensive zookeeper training was to volunteer or intern at Big Cat Rescue, in Tampa, FL. Minimum time requirements for onsite training range from four hours a week to 16 hours per week. Due to the danger involved in caring for lions, tigers, ligers, leopards and other wild cats, it takes two years of training to achieve proficiency, so it would mean years of commitment for you to progress through that experience. With Zoo College you can pace yourself and test your knowledge, using all of the same teaching guides, videos and methods, before making such a huge commitment of time or finances for a biology degree that won’t give you any real sense of what it means to care for wild animals in a zoo or sanctuary setting. For a limited time you can take the Bobcat Rehab course for free! Ready to change your life? Just register and then enroll as a member to get on your way to a dream job working with animals.